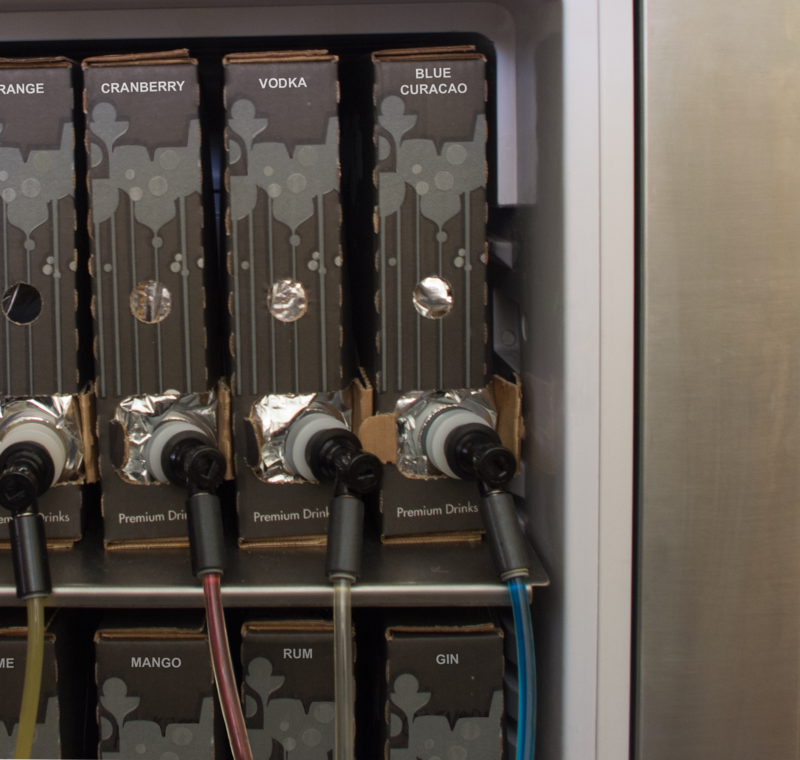 The cocktail dispensing machine can have 16 or 24 separate lines and pumps enabling an extensive variety of ingredient selection. Our team will install the machine in the position pre-arranged with you. It can be mobile (on wheels) or fixed (on counter). 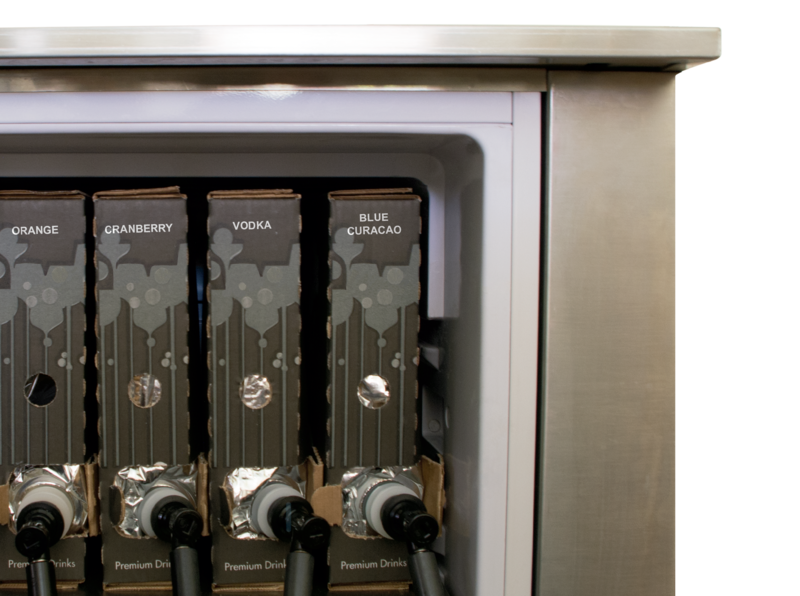 Additionally the fridge and ingredients can be stored up to 20 metres away from the bar in a dispensing room. Installation and staff training takes one day. The easy to use software interface allows you to plugin and start using the machine straight away. We provide continued maintenance of the machine, giving you the peace of mind and more time to serve customers. We will happily advise you in creating a tailored cocktails menu that fits the needs of your venue. The software already includes over 200 pre-set cocktail recipes, all of which can be easily modified. Additionally the database can also include your own cocktail creations, allowing you to serve special or house cocktails you may already have. Furthermore the software also includes photographs, information and guidelines of each cocktail so that even the less experienced personnel becomes an expert bartender. The dispensing machine is able to proportionally increase or decrease measures into 5 categories (XS, S, M, L, XL), allowing continued use of different sized glassware. We supply you with all the ingredients required to create the cocktail combinations on your menu. This enables you to only hold stock that is necessary. All ingredients come in 5-litre ‘bag-in-box’ style packaging meaning lower storage needs, less breakage and reduced waste. Our ingredients are meticulously produced by our supplier based in the Canary Islands, a family run distillery in the industry since 1887. The machine recipes can also accommodate manually poured ingredients that are less frequently used or are used in small quantities, in order to add further personalisation. 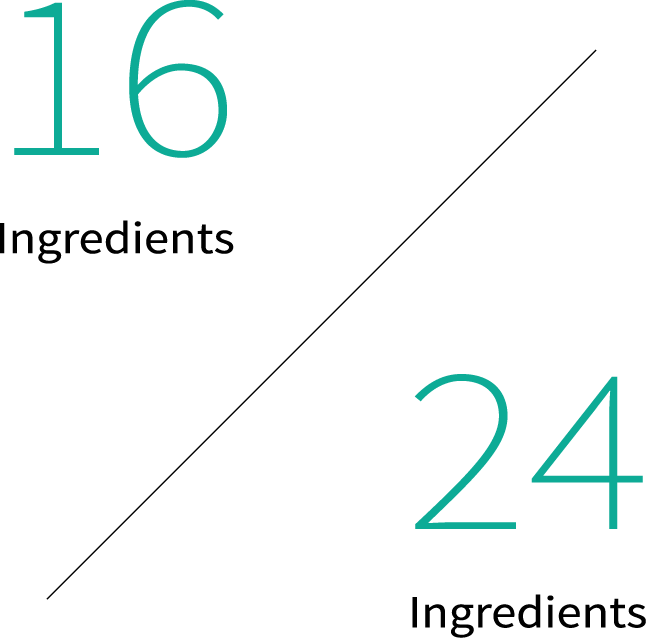 All ingredients are delivered at no cost. 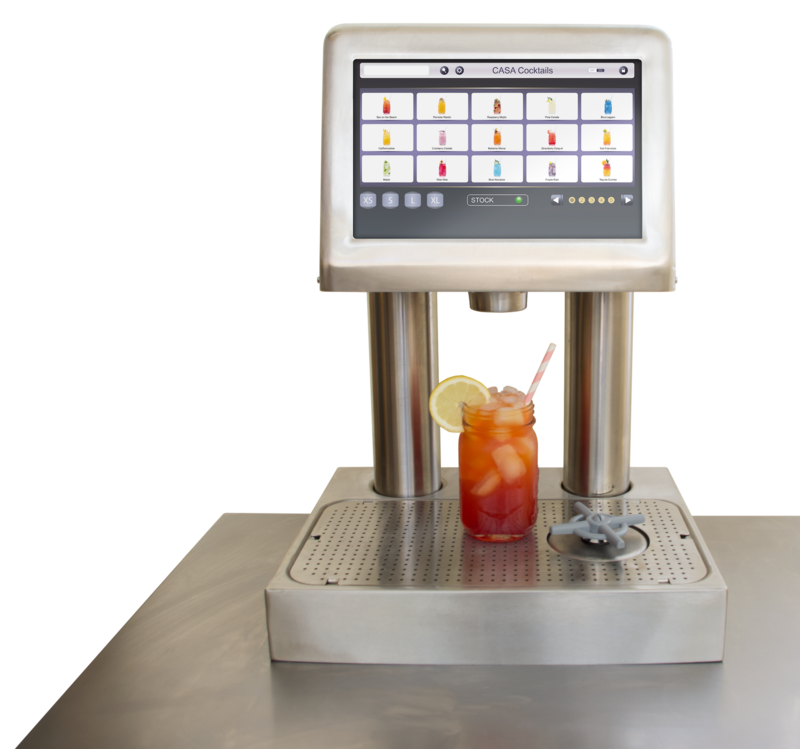 The machine keeps track of every cocktail dispensed and periodically sends real-time data records. 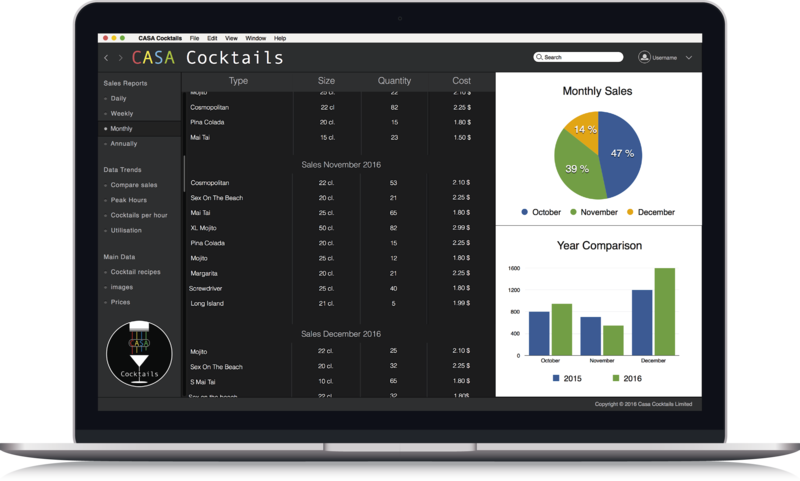 This provides you with unrivalled sales data and trends, giving you further insight in how your bar is performing. The data allows us to provide an automated stock taking service so that you can focus on your customers and less on bar resourcing. Furthermore the machine eliminates over-pouring and giveaways as our data needs to match your till sales. Pay per cocktail means no capital outlay is required to benefit from Casa Cocktails machine. Once the machine is up and running, we only ask that you pay us a fixed amount per cocktail sold. This means you make a profit from the first cocktail. The cost per cocktail depends on the package most suitable to your venue and the number of cocktails you are able to sell. Prices are very competitive and we expect our customers to see increased turnover, higher profit margins, and improved cash flow. Learn what Casa Cocktails can do for you. Copyright © 2017 Casa Cocktails Limited. Copyright © 2017 Casa Cocktails Limited. All Rights Reserved.